Ruby has been extra sweet and good lately. She seems to know when I can use closeness and a cuddle, and when to remind me to play, smile and laugh. As a testament to how crazy about her I am, I can just stare at her when she is sleeping, admiring the pink of her ears, her splotchy lips, her funny "wild hairs" - the ridiculously long sprig on her shoulder, the only clue to a Border Collie coat - her perfect little paws, the way her nose wiggles as she's sniffing along the path of her dreams. I adore her more every day. As tired as I am of winter, it's a wonderful excuse to cuddle up inside with a pup friend. I'm glad you and Ruby are enjoying spending time together. 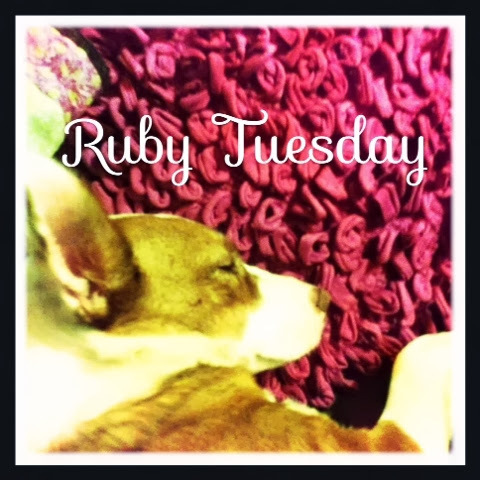 Ruby is so pretty, and this post made us fit in a quick cuddle sesh! Our dogs are like that. What I love is that our adult dogs will push into me to give a warm hug right when I need it. The puppies are learning to do the same.